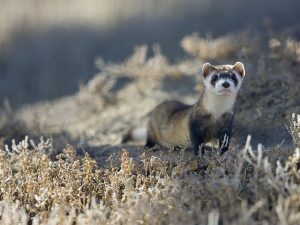 Wyoming wildlife authorities discovered a small population of the ferrets quietly living in the area around Shep’s discovery. But the population was still declining. We had already lost the black-footed ferret once. We weren’t going to lose it again. Authorities successfully captured 24 black-footed ferrets and brought them to a captive breeding facility. That’s when the Black-Footed Ferret Recovery Program was born. Since 1991, state and federal agencies have worked with private landowners, nonprofits, Native American tribes and North American zoos to reintroduce black-footed ferrets into the wild. 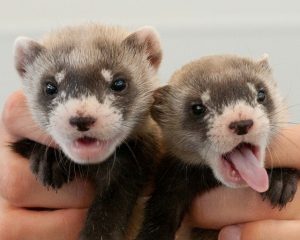 The North American zoo community was particularly influential in the captive breeding programs that helped reintroduce ferrets in Wyoming, Montana, South Dakota, Arizona, Colorado, Utah, New Mexico and Kansas. A memorable moment for me came in the early years of the captive breeding effort, when I had a chance to step inside the ferret enclosure at the National Zoo’s breeding center in Front Royal, Virginia, while a slender ferret scampered past my feet. The inception of safe harbor agreements also played a significant role in securing the cooperation of private landowners in conserving ferrets as part of the U.S. 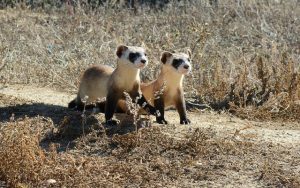 Fish and Wildlife Service’s Black-footed Ferret Recovery Plan. Under these agreements, many landowners have permitted the introduction of ferrets on their property without incurring regulatory restrictions. Black-footed ferrets are considered a flagship species of the North American prairie – their survival being directly tied to the survival of 130 other plant and animal species that comprise the American prairie ecosystem. As an example of this, the prairie dog – another icon of the American prairie – was experiencing population declines due to agricultural and other development. Adult black-footed ferrets eat up to one prairie dog every three days, making up the majority of the ferret’s diet, so the decline of prairie dog populations led to a sharp decrease in black-footed ferret populations. This example demonstrates how interconnected the success of species and ecosystems are to one another, and why protections for a single species like the black-footed ferret can help protect an entire landscape like the American prairie. Long-term protection for the black-footed ferret is guaranteed by the Endangered Species Act, which has boosted the population up from 18 to more than 1,000, thanks to the help of landowners and multiple other stakeholders. Today, there are approximately 1,410 ferrets in the wild, with numbers increasing every year. It’s a remarkable story of recovery that gives me great hope for America’s wildlife, even species on the brink. Michael Bean started working at EDF in 1977 directing wildlife conservation policy initiatives. In 2009, Michael joined the U.S. Department of the Interior as counselor to the Assistant Secretary for Fish, Wildlife and Parks, and later as the Principal Deputy Assistant Secretary. Today, Michael is back as an advisor to EDF. This entry was posted in ecosystems, Endangered Species Act, Wildlife Protection and tagged black-footed ferret, conservation, Endangered Species Act, endangered species act success stories, north american zoos, Safe Harbor, wildlife, Wyoming. Bookmark the permalink. Both comments and trackbacks are currently closed. Stop messing with nature; you are killing it.